What is it about butterflies that captures our imaginations? They are so colourful, yet so ephemeral, that artists have been trying to capture their beauty for years. But what about those butterflies that live inside us? Are they such a good thing? Find the answer in Taming Butterflies, a children's picture book written by Sue Whiting, illustrated by Mini Goss, and published by New Frontier Publishing, Australia (2004). This book was chosen for the Victorian Premier's Reading Challenge. What do you do when you have butterflies in your tummy, the ones that make you shy, nervous and all a-flutter? One day a visitor arrives, who shows Tilly how to make those pesky butterflies be still. Kids will know the nervous feeling well. We relate to little Tilly, who only feels safe and calm when she's snuggled next to Mum. Whiting's lyrical text helps us see inside Tilly's world and understand the situations that make her shiver and shake. How she learns to cope, with Marjory-Anne's help, makes an entertaining story and helps kids deal with anxieties of their own. As you would expect in a book with a butterfly theme, Mini Goss's illustrations are bright and colourful. She shows us not only Tilly's fear, but that of her toys, giving kids extra details to look out for. I predict young readers will also enjoy looking at all the different butterfly patterns and colours. 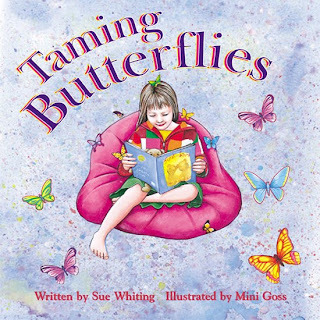 Taming Butterflies is a great book to read aloud - it has passages just begging for kids to join in or role play. I think it is a perfect choice for schools and libraries, but also perhaps for doctor's waiting rooms and hospitals - places where kids need techniques for coping with anxiety. If you are the parent of a child who is shy or nervous, the book might be a reassurance and a focus for discussion. New Frontier has added value to the book with Teacher's Notes written by Sue Whiting. What a beautiful story. I will need to see if our school library has it. I now what to read it. I think your kids will love it too, Sparkely!